'May It Last' Brings The Avett Brothers From North Carolina To HBO Judd Apatow is one of the directors of a new documentary airing on HBO that follows the recording of a Grammy-nominated album from the North Carolina band. Scott and Seth Avett in the HBO documentary May It Last: A Portrait Of The Avett Brothers. Music documentaries often either begin or end — or both — with a performer's triumphant moment. So does May It Last: A Portrait Of The Avett Brothers, begin at Madison Square Garden in April 2016, where Scott and Seth Avett are chatting with a crew from "MSG's digital content department" about what it's like to be there performing for the first time. Can they talk a little bit, the host asks, about playing at MSG? "We can't talk a whole lot about playing yet, 'cause we never have before," Scott says, 95 percent telling the truth and 5 percent gently busting her chops. Then the fellas, backstage, show their passes to security ("Awesomesauce," the guard thumbs-ups) on their way to the interview room. The film then doubles back to an almost delirious credits montage of scruffy home videos, grubby bar-band gig footage, introductions by David Letterman and Jimmy Kimmel — all scored by the band's slow-building, delicately harmonized "Laundry Room." Midway through, it transitions from the sound of the studio recording to a live performance in which the band demonstrates the much more raw, ecstatic presence that can be found, among other places, in their Tiny Desk Concert. That, too, begins with "Laundry Room." The Avett Brothers, roughly speaking, are part of the genre often unsatisfyingly referred to as "Americana." They are bluegrass and country flavored, and yes, there is stomping and clapping. And let me say this first, on a personal note: This is a band I really like. I sat perhaps eight feet from them at the Tiny Desk, tucked into a corner, and it remains one of the most memorable live performances I've ever seen. I wrote an entire, lengthy work of fiction mostly under the influence of an endless shuffle of their driven stompers, their swoony love songs, and their acidic tales of loss and grievous error. Most of the film is nominally occupied by the story of the recording of True Sadness, which was nominated for a Grammy Award for Best Americana Album in 2017 (they lost to William Bell's This Is Where I Live). In the sunny Echo Mountain Studios in Asheville, N.C., under the stained glass of the old church where the studio was built, they start to work. And their superstar producer, Rick Rubin (a multiple Grammy winner who's worked with bands right from AC/DC all the way to ZZ Top), explains that they're an unusual sibling-based band in the following sense: They like each other. And that launches the twinned themes of the film: It's a music story, but it's also a story of families, both born and made. And it's a story of creative collaborations inflected through close relationships, and the way that doesn't always have to mean turmoil, as it often does in musician histories. That's not to say there isn't turmoil or that the film represents the entirety of the band's history and relationships, but a vision of positive and supportive cooperation as inherently interesting is a relief in a landscape that's often dominated by really sad stories. It's not only from abject misery and terrible behavior, after all, that great art emerges. May It Last is directed by Judd Apatow and Michael Bonfiglio. Bonfiglio worked with celebrated documentarians Joe Berlinger and Bruce Sinofsky, who made, among other films, the Paradise Lost series and the Metallica documentary Some Kind Of Monster. Judd Apatow ... is Judd Apatow. They rely heavily on interviews, not only with Seth and Scott Avett, but also with their collaborators, including but not limited to Bob Crawford, who plays stand-up bass; Joe Kwon, who plays cello and does everything from social media to travel arrangements; Tania Elizabeth, who plays fiddle; and Dane Honeycutt, who eventually became their tour manager after long ago meeting Seth and Scott cleaning carpets. Family is around, too — particularly their parents, Jim and Susie Avett, and Scott's wife and kids. Because Seth and Scott write together, one point of fascination is collaborative songwriting, and what exactly it looks like when it's not another name for half the songs coming from one writer and half coming from the other. You watch them writing what became the song "I Wish I Was," from stubs and strange ideas, from eyes closed in concentration, and little leaps that come from improvisation. It's an effort to document inspiration patiently in real time, and when the sequence circles back to a performance of the song live, it's enormously satisfying. The intimacy and satisfaction of working on music, of course, sit beside the challenges of being a touring band — how Scott's wife Sarah and their kids wait for him to come home and everyone wants to be kissed first upon his return. And, too, how Seth is anticipating the birth of a child with his girlfriend. Perhaps the pivotal sequence of the film is the recording of the song "No Hard Feelings," an exquisite and simple exploration of how to live, told through the structure of contemplating how you want to die. The song employs everyday imagery alongside grander ideas of what death means — "when I lay down my fears / my hopes and my doubts / the rings on my fingers and the keys to my house." It returns over and over to this idea of "no hard feelings," not as a dismissive image of spontaneous deathbed forgiveness, but as an aspiration to live all along so as to have as few regrets and bitternesses as possible by the time you're finished. "I have no enemies," Seth sings over and over. And in the aftermath of that session, it becomes clear that something has happened. There's an opaqueness — one that comes from generalities, not disingenuousness — to what follows, but there's something fragile and rare about the conversation that Seth and Scott have outside the studio about the session. It's logical, maybe, that this is the work of a well-trained documentarian like Bonfiglio and also of Judd Apatow. Apatow has never directed a documentary feature, but at his best, he's made films about people — mostly men — growing into the best handlers of their own emotions. And there's a good match here between style and subject. Slack, casual storytelling threads connect powerful performances and creative explorations in much the same way Avett Brothers songs will sneak up on you with a catchy hook and then punch you in the gut. It's a fine film, both as a music documentary and as a family story. 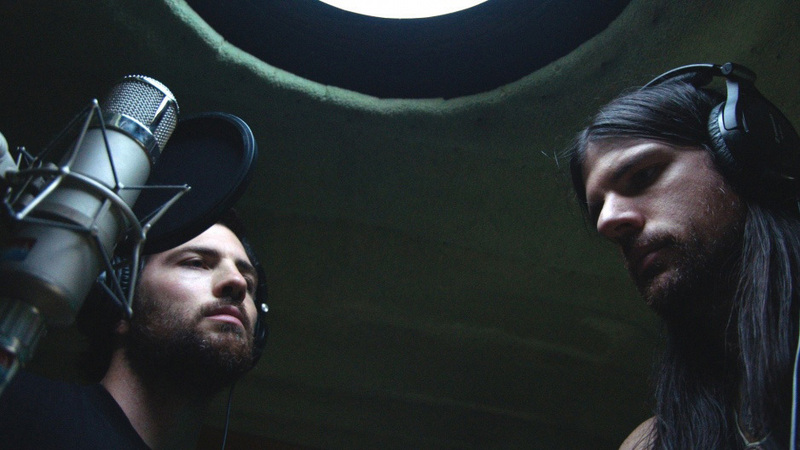 May It Last: A Portrait Of The Avett Brothers premieres Monday night on HBO.